The wings open too slowly. I’d try using compressed air, a couple of small solenoid valves, and an air cylinder for a much faster/more impressive looking mechanism (plus you get the sound effects from the air cylinder). Regardless, it’s pretty cool looking. They’re pretty much what you described, pneumatic. A very nice and well-thought-out build. Just one minor concern though… If I’m being chased towards the edge of a cliff by angry natives, I’d really prefer a set of wings that unfurls a wee bit faster. That aside, it is still a very nice and well-thought-out build! Really nice build. Are you going to show it at some steam punk festival? By the way, that Massager looks like a great cheap linear actuator for a milling machine for example. Any words on if this is possible or not? With due respect to DaVinci, he may have pinched the basic idea from Icarus’ dad,but getting rid of the fatal bee’s wax design flaw. I believe it was on instructables where I seen a similar build. As recall it was manual, and deployed much faster. Not intending to derided this build in any manner. Some kind os spring tension system would deploy the wings much faster, but you couldn’t automaticly retract them, so this is a good compromise between speed and convienence. Man, that girl is stupidly cute. I can’t make the video play whatsoever. Vimeo fail. Very nice build, but where can I get such an adorably cute girl to match it? Great re-use of a device. The use of the massage chair orbs is a fantastic idea. Seeing those orbs being used made me think of other great uses for them. Possibilities: robotics, remote camera PTZ, automated blinds/shades, movie projector screen automation. I love the build. Great job man. Your daughter pulled the steam-punk girl look off to a tee. I would love to have seen the wings deploy faster (and retract) but honestly this still rocks no matter how fast the wings deploy. 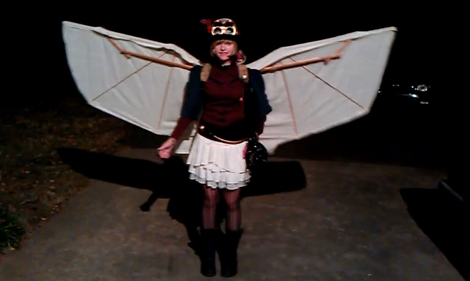 I think Halloween was over by the time her wings deployed. Yes, faster wing deployment for “actual” use, but a slow deployment is more theatrical, and less likely to poke some bystanders eye out. oh yeah, have it play “Flight of the Valkyries” while it is deploying! Hang on.. is she supposed to look “Steampunk” there? Her wings are cool but I like mine better. I am still working on making them better. Secondly the stretched vertical configuration isn’t seen often so I guess kudos for being somewhat more original in your effort to do the same things as everyone else.